The expansion of carbon materials is multidisciplinary and is related to physics, chemistry, biology, applied sciences and engineering. 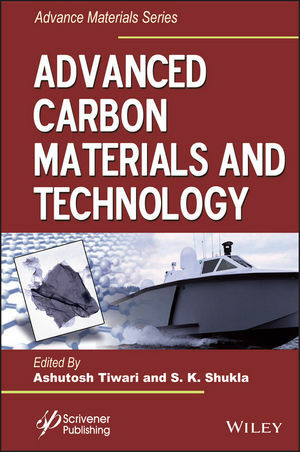 The research on carbon materials has mostly focused on aspects of fundamental physics as they unique electrical, thermal and mechanical properties applicable for the range of applications. The electrons in graphene and other derived carbon materials behave as dirac fermions due to their interaction with the ions of the lattice. This direction has led to the discovery of new phenomena such as Klein tunneling in carbon based solid state systems and the so-called half-integer quantum Hall effect. Advanced Carbon Materials and Technology presents cutting-edge chapters on the processing, properties and technological developments of graphene, carbon nanotubes, carbon fibers, carbon particles and other carbon based structures including multifunctional graphene sheets, graphene quantum dots, bulky balls, carbon balls, and their polymer composites. Ashutosh Tiwari is an Associate Professor at the Biosensors and Bioelectronics Centre, Linköping University, Sweden; Editor-in-Chief, Advanced Materials Letters; Secretary General, International Association of Advanced Materials; a materials chemist and also a docent in applied physics from Linköping University, Sweden. He has published more than 350 articles, patents, and conference proceedings in the field of materials science and technology and has edited/authored more than fifteen books on the advanced state-of-the-art of materials science. He is a founding member of the Advanced Materials World Congress and the Indian Materials Congress. S. K. Shukla is currently an Assistant Professor in the Polymer Science Department, Bhaskaracharya College of Applied Sciences, University of Delhi, India. He earned his MSc and PhD degrees in chemistry from the Deen Dayal Upadhyay Gorakhpur University, India. He has published more than fifty papers and is the author of seven book chapters. He is the recipient of the International Association of Advanced Materials Scientist Award for his contribution in the area of electronic carbon materials and technology.